What can you say about a fact checker that makes up facts out of whole cloth? The pictures tell the story (albeit the pictures have words embedded). For starters, Republicans proposed mandatory minimum sentences — ranging from 5 to 15 years — on certain sexual assault crimes. However, advocates of domestic violence awareness were specifically against the inclusion of these provisions. So McConnell was right. Democrats wouldn't support mandatory minimum sentences for certain crimes involving violence against women. Presumably Democrats opposed longer minimum sentences because allowing people with a history of committing violence against women out of jail sooner presents no threat to women. Or maybe it gives lawyers more work. Perhaps McConnell could argue that the mandatory minimum sentences Republicans required in their alternative made for a "stronger" bill, but advocates of domestic abuse awareness opposed this measure as unnecessary. And the Republican measure was absent several protections for certain groups that were included in the bill Obama signed. McConnell is within his right to oppose those provisions, but it makes it hard for him to prove that he supported "stronger" legislation. These fact checkers do not give the facts. They make them up. Though our research shows PolitiFact Wisconsin may have an axe to grind against the Democratic Party of Wisconsin, that doesn't necessarily mean PF Wisconsin isn't biased against Republicans. On Aug. 4, 2014, PolitiFact Wisconsin published a hacktastic fact check of Governor Scott Walker. This one certainly belongs in PolitiFact's crowded annals of fact checks too absurd or inept to qualify as fact checks. PF Wisconsin contacted the Walker campaign about the statement. Walker spokesperson Alleigh Marré said Walker was saying Romney didn't base his campaign all or mostly on his business experience. But Walker did not couch his remark that way; he said Romney didn’t offer his business experience even as "a" reason to support him. That’s a rewrite of history. Unfortunately for PolitiFact Wisconsin, striking "run his campaign on the basis of" and changing "arguing" to "argue" represent a rewrite of history. With the quotation intact, Marré's explanation makes good sense and must warrant strong consideration as the correct interpretation of Walker's statement. PolitiFact Wisconsin's argument based on a telltale "a" doesn't pass the sniff test. Despite the obvious reasonable explanation, PolitiFact Wisconsin insists that if Romney offered his business experience as a reason to vote for him, then that means Walker's claim is ridiculously false. So PolitiFact Wisconsin produces the smoking gun: Scott Walker introduced Romney at a campaign rally and praised his business experience! We reviewed the video clip. Yes, Walker praises Romney's business experience. But he he goes on to say that the big reason to vote for Romney stems from is leadership as governor in a state dominated by Democrats. In short, the supposed smoking gun, along with the rest of PolitiFact's evidence, dovetails extremely well with the explanation from the Walker campaign. Here's Walker's speech introducing Romney. We can't imagine what would possess PolitiFact Wisconsin stalwarts Dave Umhoefer and Greg Borowski to see this as a "Pants on Fire" falsehood from Walker. Unless they're liberally biased, of course. Then it makes sense. A serious fact check would accept the reasonable explanation from the Romney (bww 8-9-14) Walker campaign and then test whether the Burke campaign's emphasis on her business career differs significantly from Romney's. Maybe Walker's claim would check out, and maybe it wouldn't. If only there was somebody out there to help us find the truth in politics. But alas! For what it's worth, Burke's campaign website does emphasize her private sector business experience quite a bit. Earlier today, we reviewed the percentage error involved in pair of PolitiFact ratings. On July 16, PolitiFact's PunditFact rated Cokie Roberts "Half True" for a numerical claim that was exaggerated by about 9,000 percent. PunditFact justified the rating based on Roberts' underlying argument, that the risk of being murdered in Honduras is greater than the risk in New York City. 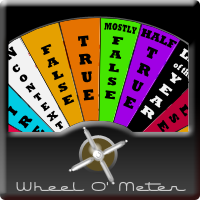 On July 31, PolitiFact Oregon rated George Will "False for a numerical claim that was off by as much as 225 percent. Will claimed healthcare companies.make up 13 of the top 25 employers in Oregon, and occupy the top three positions on top of that. The former claim was off by as much as 225 percent and the latter claim was off by 300 percent or so. PolitiFact found Oregon's largest employer was a healthcare firm. Today we take fresh note of a July 14 fact check from PolitiFact Virginia. PolitiFact Virginia tested the claim of Democrat Mark Sickles that 70 percent of Virginia's Medicaid budget pays for care for seniors in nursing homes. PolitiFact Virginia said the true number was 9.7 percent. From that number, we calculate a percentage error of 622 percent (PolitiFact can't be trusted with that calculation). PolitiFact Virginia gives Sickles no credit for his underlying argument and rates his claim "False." What determines whether PolitiFact rates the underlying point along with the literal claim? How big does an error need to get before a claim warrants a "Pants on Fire" rating? Changed "Will claimed healthcare companies.make up 13 of the top 25, and occupy the top three positions on top of that" to Will claimed healthcare companies.make up 13 of the top 25 employers in Oregon, and occupy the top three positions on top of that." PolitiFact Oregon provides us with a great item to compare to our July 30 examination of mathematics at PolitiFact's PunditFact project. In the PunditFact item, we noted that Cokie Roberts used a probability comparison that was off by almost 9000 percent and received a "Half True" rating from PolitiFact, thanks to her underlying point that getting murdered in Honduras was more likely than in New York City. On July 31, PolitiFact Oregon published a fact check of George Will. Will wrote a few things about how prominently health care providers figure in Oregon's list of top job providers. Will was making the case for a medical doctor in the senate, Republican candidate Monica Wehby. Will, in a column supporting the candidacy of Republican Senate candidate Monica Wehby, included a link purporting to show Oregon’s 25 largest employers. The chart, he wrote, indicated that the dominance of large health care providers in Oregon -- the three largest employers and 13 of the top 25 in the state fit that niche, according to the chart -- make Dr. Wehby the best choice for the job. Calls and emails to many of the companies listed, however, indicate that the chart’s numbers are way off, often wildly so. The top three employers on the list Will used are, in fact, a single entity. And by our count, the highest number of health care providers that can rank among Oregon’s top 25 employers is nine, not the 13 Will cited. Will was off by as much as 225 percent (using four as the number of health care providers in the top 25), apparently totally overwhelming any underlying point he had about about health care providers employing quite a few Oregonians. After all, it's way too much to ask for consistency from mainstream media fact checkers. Incidentally, we found healthcare/social assistance combined make up about 12.6 percent of all jobs in Oregon (as of June 2014, seasonally adjusted). That's about 15.1 percent of the private workforce. The line circled in red will appear false to many readers, positioned as it is under a "Truth-O-Meter" graphic blaring the message "False." But it's only false, PolitiFact's presentation implies, because the bill wouldn't have taken effect now but in the future. That reading impugns McConnell along with his Democrat attacker. Worse, it isn't even accurate. ∙ Her figure was based on the Paul Ryan budget plan. ∙ There have been several incarnations of the Ryan budget over the years and Lundergan Grimes chose to go all the way back to the 2011 version. ∙ Every version of the Ryan budget since then was re-tooled to eliminate that $6,000 cost. ∙ Don Disney, the man in the ad who claimed McConnell "voted to raise my Medicare costs by $6,000" is 75 years old, so no version of the Ryan plan would saddle him with $6,000-plus in additional out-of-pocket costs. ∙ That bill wouldn't have gone into effect until 2022 and would not have affected people like Disney who were seniors when the bill was passed. ∙ McConnell voted for a motion to proceed on the Ryan budget. That allowed it to proceed to the Senate floor for debate and amendments. But McConnell never voted on the final passage of the bill. There was no bill passed to raise Disney's Medicare costs by $6,000, McConnell never voted for the passage of any bill that would have raised Disney's costs by $6,000, and McConnell didn't vote for the passage of any bill that would have cost any senior on Medicare $6,000 in extra expenses. The content of the article confirms this summary, yet PolitiFact mentions nothing about the fact McConnell didn't actually vote for the passage of the bill. On top of that, the graphic on the main page gives people the impression that McConnell voted to raise costs to seniors by $6,000, with those costs inflicted on seniors at a later date. That's false. Liberal bias leads to another "Politifact fail"
We just finished updating one of our "Nothing To See Here" posts after PolitiFact Texas revisited a speech by Senator John Cornyn's Democratic challenger, David Alameel. PolitiFact Texas picked on a fairly innocuous statement from Alameel's speech in late June. We found other statements in the speech we thought were more politically significant. In our update we review the timeline of the reporting. We think it's reasonable to suspect that our post helped prompt this new fact check of Alameel by PolitiFact Texas. This example featuring Alameel shows again how story selection may easily skew the "report cards" PolitiFact publishes to help serve as voter guides.